Marine populations have also suffered badly, with sea-based creatures crashing by 40%. The number of turtles has fallen by 80%, due to the destruction of nesting grounds and drowning in fishing nets, said the Guardian, quoting stats from the 2014 report. 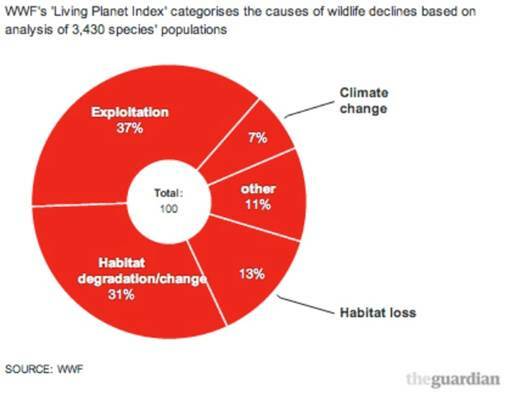 Scientists blame the destruction of wild habitat on farming, logging and development, for what is seen as the sixth mass extinction of life to occur on our 4 billion-year-old Earth. The marine LPI shows a decline of 36 per cent between 1970 and 2012 Trend in population abundance for 6,170 populations of 1,353 marine species monitored across the globe between 1970 and 2012. The Earth has gone through five major extinction events - from the Ordovician-Silurian (350 million years ago), to the Cretaceous-Paleogene (65 million years ago), in each event 70-90% of all species died. The just started Anthropocene, or the age of the humans, is considered by scientists to be the 6th extinction event. 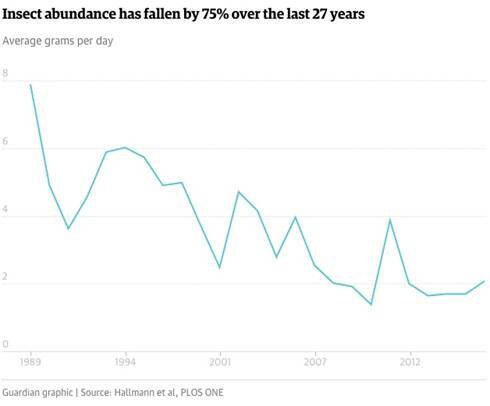 That’s real bad news for humans long before even 50% extinction - loss of species means loss of pollinators - which is a real problem since so many varieties, and so much of our food crops rely on insects (ie. bees) to pollinate. This article is all about the birds and the bees, and other indicator species that give us clues about how our planet is changing, and not in a good way. The world is dominated by plants, which make up 82% of all living matter. Marine species are actually fewer than thought. They represent just 1% of all biomass. Most of life is land-based and one-eighth is bacteria dwelling underground. Viruses have a combined weight three times that of humans. Fish have 12 times the global mass of humans and fungi 200 times. 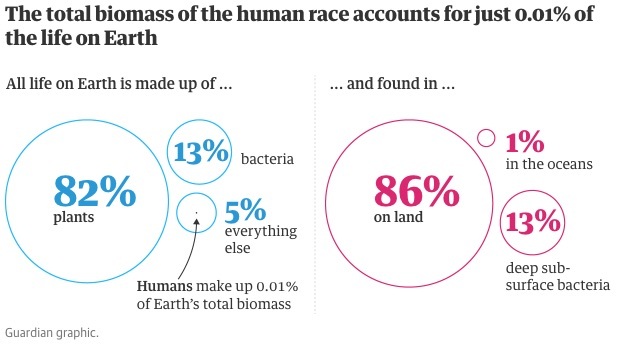 So, despite humanity’s obvious supremacy on the top of the food chain, if the rest of Earth’s animals, plants and bacteria somehow managed to gang up on homo sapiens, it wouldn’t be a fair fight. Humanity would be crushed. Another interesting finding from the research is that the domestication of animals has significantly depleted wild species. The factory farming of poultry has meant that chickens now make up 70% of all birds, while 60% of mammals are livestock, mostly cattle and pigs. Only 4% are wild animals. The transformation of the planet into one that has been molded by human activity has led to the creation of a new geological era known as the Anthropocene, which scientists trace back to the 1950s, when major changes to the Earth began to take place, including the dispersion of radiation from nuclear bomb testing, the beginning of mass plastic pollution, and emissions from power stations. Radionuclides left over from atomic bombs in the 1940s and 1950s. The advantage these nuclear markers have over all the other proposed markers is that plutonium, caesium, strontium etc. can all be linked to a specific date in time as well as a clear line in rock. The widespread use of plastic. The release of poly-aromatic hydrocarbons from burning fossil fuels. And last but not least, lead contamination from petroleum. All leave their own very distinctive telltale traces in the Earth’s rocks. Rocks are used to define the different time periods in Earth’s history. For example - the start of the Cambrian period marks the moment in time when major groups of animals first appeared as fossils in rocks. 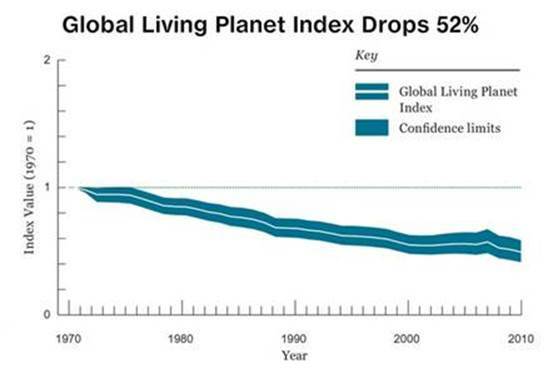 The Global Living Planet Index (LPI), shows a decline of 52 per cent between 1970 and 2010. The LPI is based on trends in 10,380 populations of 3,038 mammal, bird, reptile, amphibian and fish species. 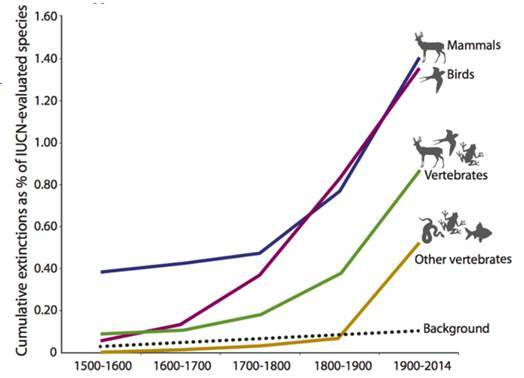 The global LPI tells us that more than half of the world's vertebrates disappeared between 1970 and 2010. After all, if the start of the Cambrian period marks the moment in time when major groups of animals started to appear in the fossil record why not use 1970 for the start of the Anthropocene, you know, define the moment when they started to disappear? The seasons come and go, and birds have always adjusted to the warming climate to lay eggs and nest at the perfect time to ensure they always have enough food to rear their young. But climate change is throwing a wrench into the seasonal migrational patterns of birds. Studying the interval between spring plant growth and the arrival of 48 North American bird species between 2001 and 2012, researchers at Memorial University in Newfoundland and Florida’s Museum of Natural History found the gap is growing at a rate of one day a year. Some bird species can adapt to the change, by arriving earlier, but those who can’t are having problems. They are missing the chance to find good nesting spots or to feed on insects. Among the species struggling to keep up with early springs are great-crested flycatchers, indigo buntings, northern parulas, blue-winged warblers and Townsend's warblers, CBC reported. The result means that fewer birds are likely to survive, reproduce and return the next year. Bird population declines have also resulted from loss of habitat, due to wetlands being drained for farming or development. In the UK, of the most common birds, 16 species have declined by over a third since 1995. Bees are considered one of the most important indicator species due to the crucial role they play in plant pollination. It’s been estimated that one out of every three bites of food is made possible by bees and other pollinators - with honeybees pollinating some $15 billion worth of crops each year. Bees from one hive can collect pollen from up to 100,000 flowering plants, daily. However according to Conservation International (CI), 10 million hives have disappeared from 2014-17. What’s causing bees to die off? There are various theories, but among the most likely culprits are habitat loss, shifting temperatures, and disease. Due to warming, bees are not migrating to cooler areas to establish new hives. There are almost 200 miles less in the way of bee territories in North America according to a recent study. Bees are finding a mismatch between when the pollen arrives and when they feed on pollen. According to CI, even a mismatch of 3 days can make bees less likely to reproduce and less resistant to predators or parasites. Less healthy bees make them more susceptible to infections, like Varroa mites and the gut parasite Nosema ceranae. A feature article in Rolling Stone discusses the role of insecticides in killing off bee populations. Blame is laid on a new class of insecticides known as neonicotinoids, or neonics, that started being used intensively on crops in the early 2000s. The insecticide compound is easily applied to plants, making them more resistant to predators, but it also damages the brains of bees. Many vegetables, fruits, nuts, legumes and seed crops are dependent on pollination and that service is provided mostly by bees - one of the most important global pollinators of native plants. The bumblebee is disappearing – bumblebee numbers are declining in Europe, Asia and North America. Honey bees are also disappearing at an alarming rate - colony loss in North America, since 2004, has resulted in fewer managed pollinators than any other time during the last fifty years. The idea of insects dying through global warming doesn’t evoke the same reaction as if it were koala bears, but the impacts are much more serious. Insects are vital to the cycle of plant pollination; many fruits crops and wild plants are insect-pollinated. Insects also form the bottom of multiple food chains and their loss or reduction has repercussions up the line, for example on birds that feed on them. So why are insect numbers declining? A big reason has to do with pesticide-based agriculture, where a variety of poisonous chemicals are dusted over crops to prevent insects from eating them and affecting farmers’ yields. In 2016 scientists warned of an “ecological Armagaddon” after discovering that three-quarters of flying insects in Germany and likely elsewhere had perished over the last 25 years. The losses are said to be compounded by global warming, which causes habitat destruction. A recent analysis published in the journal Science compared the geographic ranges and climate conditions of 31,000 insect species, 8,000 birds, 1,700 mammals, 1,800 reptiles, 1,000 amphibians and 71,000 plants. The study found that when the temperature warmed up to a certain point, some regions could no longer support some species. 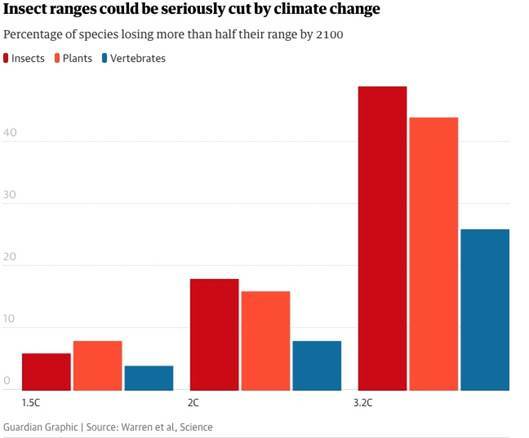 Climate change could make nearly half of insect habitat unsuitable by 2100, states a May 2018 Guardian article. Some insects are also getting smaller. Ecology students at UBC in Vancouver found that 22 beetle species shrank when raised in warmer than normal temperatures - the snail killing carabid beetle has shrunk 20% in the last 45 years. Indicator species - birds, bees and bugs - are like the proverbial canary in a coal mine. Problems with these animals are a sign that our planet could be in trouble. For the proper functioning of the ecosystem, we need our birds, our bugs and our bees to survive and thrive. This requires smart management of the available land base which of course face pressures from increasing populations, domesticated animals and development, particularly urban sprawl. We one-tenth percenters might be at the top of the food chain, but as Uncle Ben in Spiderman said, “with great power comes great responsibility” to ensure that those underneath us continue to populate the Earth even as it experiences ecological changes. to intensify and multiply. Are birds, bees and bugs on your radar screen?